It’s that time again — basketball fever is in the air. Even if you don’t follow college basketball, you’ve probably heard of the tournament that decides the national champion. 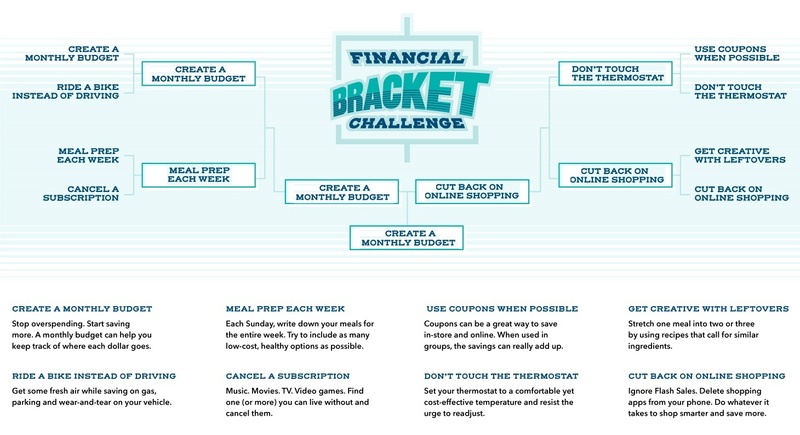 We chose to join in the fun this year, but instead of college teams, our tournament is between eight different ways to save money. Here’s how it worked: On March 21, we posted a poll on our Facebook page for the first matchup. We then continued posting polls for each new matchup until our voters crowned a champion. Hundreds participated over the course of two weeks and in the end Create a Monthly Budget was the winner! Want to participate in future activities like this? Remember to follow @OneMain on Facebook! The views and opinions expressed in this article are those of the author and do not necessarily reflect the opinion or position of OneMain. The information in this article is provided for education and informational purposes only, without any express or implied warranty of any kind, including warranties of accuracy, completeness or fitness for any particular purpose. The information in this article is not intended to be and does not constitute financial, legal or any other advice. The information in this article is general in nature and is not specific to you the user or anyone else. The author was compensated by OneMain for this post.